My goal is to provide individuals with the knowledge, skills and attitudes to express themselves creatively through music. 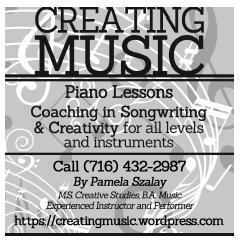 Although my specialties are piano and voice, I can help any musician tap into his or her creativity through individual lessons, personal coaching and group workshops. I work with beginner to advanced students, covering all elements of musical understanding and performance.